Organ recitals are held regularly at St Matthew's and recitalists of the very highest calibre and of international renown travel from far and wide to play the fine four manual 1895 Walker Organ. Regular organ recitals, details of which can be found here, normally take place on Sundays at 7.30pm following Choral Evensong, sung by the Choir of St Matthew's at 6.30pm. St Matthew’s is also home to the Northampton Bach Choir which, with over 130 members, is the largest choir in the county. It was founded by Denys Pouncey in 1935, the then St Matthew’s Director of Music, and gave its first concert in the church on Palm Sunday that year. 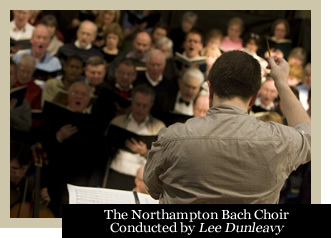 The choir, under the Musical Direction of Lee Dunleavy, performs two or three concerts in St Matthew’s each year; news of their concert season can be found at the Northampton Bach Choir's website. The church also plays host to many other groups of both local and national recognition on a regular basis. These include The Swarbrick Singers, the Northampton Chamber Choir and Northamptonshire Music and Performing Arts Trust ensembles, as well as a number of professional ensembles. In September 2011 BBC Radio 3 broadcast Choral Evensong from St Matthew’s featuring the Choir of Clare College, Cambridge and including some of St Matthew’s musical commissions. Details of all forthcoming musical events at St Matthew’s can be found here.